You have your new telescope, your first. You followed the assembly guide and now you want to get the most you can out of your investment. This first time telescope user’s guide is exactly what you are looking for. I will define terms like aperture, focal length, optical tube, mount, focuser, and eyepiece. You will learn what they mean and how to use telescopes to have an awesome celestial observing experience. 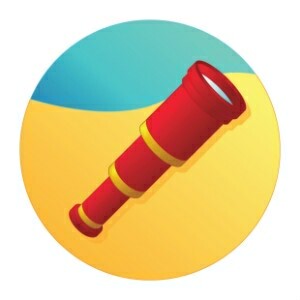 A telescope is a system of parts that work together to present an image to your eye. 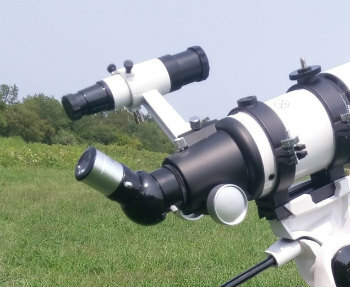 I am going to overview the parts of the system so you have a better understanding as you read this guide and other articles on telescopes and astronomy. Because this is a general guide I will touch on things that may not apply to your telescope. You might want to note which are the pieces that match to your telescope. Optical Tube – This is the part that most people think of as the telescope. The optical tube has the lens in the front (refractor) or mirror in the back (reflector or Newtonian) that is used to gather light. Some optical tubes have both lenses and mirrors. These are called catadioptric telescopes. The most common are the Schmidt-Cassegrain telescope, SCT, and the Maksutov-Cassegrain telescopes, MCT. All four types are very popular. If there is any distinction about how they are used I will call them out as we go along. I just wanted you to know the names and that not all optical tubes are the same. Aperture – The diameter of the lens or mirror of the telescope is the aperture. This is the measure of the light gathering ability of the telescope. The more light you gather the more detail you can see or the dimmer the object that you can see. This is usually measured in millimeters which we abbreviate as mm. Or it can be expressed in inches. One inch equals 25.4 mm, so you can do the conversion if you wish. A 102 mm aperture telescope would also be called a 4-inch telescope. What you need to know about aperture is that there are many things you can see with a 70 mm telescope. You can see more, and more detail, with a 200 mm telescope. Over time you will gain experience as to what objects are good for viewing with your telescope. Focal Length – This is the length of the optical path, usually measured in millimeters. We use the focal length to calculate the magnification produced by the eyepieces. The Mount – This is what holds the optical tube so you can point it and track objects as they move through the sky. There are several types. Which do you have? 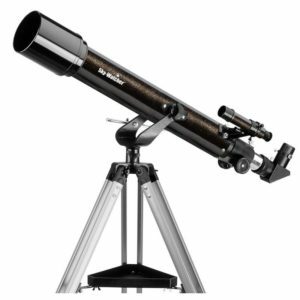 Equatorial – The most specialized mount is the equatorial mount which was specifically developed for astronomy. This type of mount was developed in Germany so they are often referred to as GEM for German equatorial mount. GEM mounts usually stand on a tripod or a permanent post called a pier. An equatorial mount requires a special alignment process called polar alignment which involves aligning the mount with Polaris, the North Star. Here’s a video on how to align an equatorial mount. There are scales on an equatorial mount that are based on the right Ascension/ declination coordinate system which is unique to astronomy. Once the mount is polar aligned you can use the RA/DEC coordinates provide on star charts to locate targets in the sky. AltAz – The more general and more familiar mount is the altitude/azimuth or AltAz mount. These work like camera tripods. You move the tube up and down or left and right to aim the optical tube or to track an object. These are extremely easy to use and highly intuitive. These are based on the degrees around the circle or compass, and degrees above the horizon, with 90 degrees being straight up. Most people will immediately understand how to use an AltAz mount. 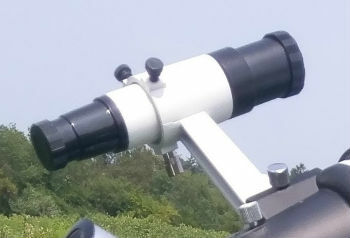 Some AltAz mounts are on tripods and some are on a Dobsonian or Dob style base. The Dobsonian design is a Lazy Susan or turntable arrangement that sits on a table or on the floor. This is a very popular design and has a reputation for being very stable and easy to use. Manual Mount – In simple terms, you do all the work. You point the scope, you find the targets, and you track them as they move through the sky. Whether equatorial or AltAz, this is the lowest cost mount. GoTo or Computerized Mount – With a computerized mount, once you do a simple alignment so the computer knows where it is on the Earth, you enter a target and the computer turns the scope to find and track it. Most computerized mounts are also called GoTo mounts because there is a button on the hand control that says GoTo, as you can see in the photo at the right. A GoTo mount has motors and is controlled by a computer handset. Using a GoTo mount is like using a GPS in your car. You punch the address in and the GPS takes you there. Some GoTo mounts have built-in GPS systems so that they can self-align to the global positioning system, just like the GPS in your car. Once the GoTo mount has located a target for you it controls a set of motors in the mount to track the object as it moves through the sky. The set-up and alignment of a GoTo mount is very specific to the brand and model. Please refer to your user’s manual for the alignment procedure for your system. Eyepiece – This is the part of the telescope system that actually provides magnification. The optical tube gathers light and the eyepiece magnifies the image. 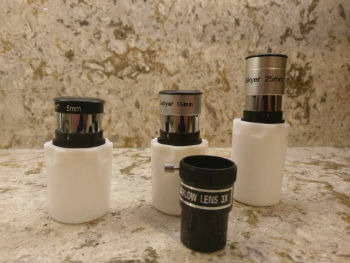 It is common to have multiple eyepieces. Most starter packages will include one to three eyepieces, each of which provides a different level of magnification. The photo on the right shows a beginner set that came with a new scope. It includes a 25 mm, 10 mm eyepiece, and 5 mm eyepiece, along with a 3X Barlow lens that triples the magnification of any of the eyepieces. The higher the number on the eyepiece, the lower the magnification. So, a 25 mm eyepiece will provide a lower power or lower magnification than a 10 mm eyepiece. Over time you may wish to add more eyepieces so that you have more magnification choices. Eyepieces are standardized so you don’t have to use the same brand as the telescope and they can be shared between telescopes. Barlow Lens – This is a device, shown in the previous photo, that goes between the eyepiece and the focuser. It multiplies the magnification of the eyepiece by a stated amount, typically 2X or 3X. The benefit of the Barlow is that it effectively gives you more magnification choices with fewer eyepieces. Diagonal – Refractors, SCTs, and MCTs typically have diagonals. Rather than having to get down on your knees to look through the telescope as it points at the stars, the diagonal bends the light to a more convenient viewing position. The key thing to know is that a 90 degree diagonal, also called a star diagonal, is optimized for astronomy. Diagonals that are 45 degrees are optimized for daytime use as spotting scopes, not astronomy. You can use either type for both but each works best for its intended application. In most cases, diagonals can be swapped so you can have two, one for night use and, if you wish, one for day use. If your telescope came with a 45 degree diagonal and will be used primarily for astronomy you may wish to add a 90 degree diagonal for convenience and comfort at some point. Newtonian reflectors do not use diagonals. Note that reflectors are not well suited for daytime terrestrial use as they invert the image. That doesn’t matter for astronomy as there is no up or down in space. However, it would be a little strange to see the boats on the lake shown upside down. Focuser – This is a moveable device that is used to focus the image. If there is a diagonal, that goes in the focuser first and the eyepiece goes in the diagonal. This is controlled by a dial that is turned to bring the image into focus. Most beginner packages have a single speed focuser. More expensive packages may have a dual speed focuser where one dial is a coarse adjustment and one is a fine adjustment. While a two-speed focuser is nice, it is not necessary. If the package has two eyepieces you have two magnification choices. If there is a Barlow lens included then you have 4 magnification choices. And if you add an eyepiece later, that eyepiece will also have two magnifications, one with the Barlow and one without the Barlow. Red Dot Finder – The red dot finder, RDF, is a targeting tool, like the sight on a gun. 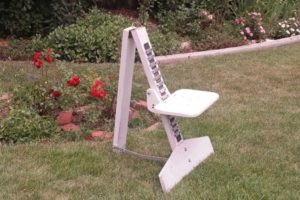 You use this to help you point the telescope at the target. 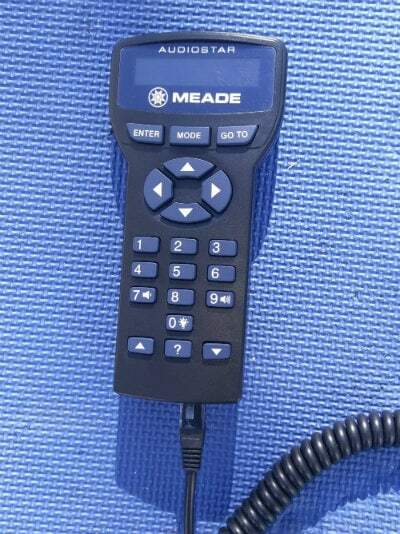 Red dot finders are low cost and easy to use. Place the dot on the target in the sky and that target should appear in your low power eyepiece. This is also referred to as a zero magnification finder. RDFs use batteries and I suggest you keep some spare batteries handy. If you forget to turn it off at the end of the session the battery will go dead. Then the next time you use the telescope you will not have a finder. 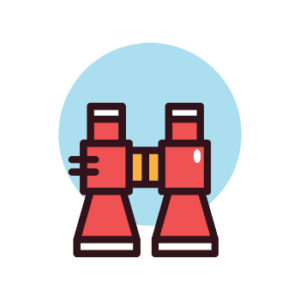 Finder Scope – This is an alternative to the RDF as a targeting tool. A finder scope is a little refractor telescope that has low magnification and a very wide field of view(how to calculate FOV). Typical sizes are 6X30 and 8X50. They are like half of a binocular. These can be helpful when you are in a light polluted area and don’t see a lot of stars in the sky. The finder will show more stars than you can see with your eye alone. Taking pictures – There is picture taking and there is astrophotography. In the language of telescopes, they are not the same thing. You can take a picture through the eyepiece of any telescope with your smartphone or a compact camera. You can buy a special frame that will hold the phone for you. Some people call this digiscoping which his very popular among bird watchers using spotting scopes or binoculars. This is not considered astrophotography. Astrophotography (AP) – Let’s just say that this is expensive and beyond the scope of this article. AP is all about the mount, not the optical tube. This involves long exposures, digital cameras, computers and more. You could spend $1000 just on the mount for AP. If you ask about scopes and mention AP, you will get a very different answer than if you say you want to take some pictures through your telescope with your smartphone. Maximum Practical Magnification –A good estimate of what the highest practical magnification is for a given telescope is 2 times the aperture in millimeters. For example, a 90 mm telescope will have a 180X maximum practical magnification on a very clear night with a calm atmosphere. This is based on how much light it gathers. However, once we get larger than about a 100 mm aperture, the atmosphere will typically be the limiting factor more than the telescope. This is the reason we put telescopes in orbit, to get them above the atmosphere. Regardless of the telescope you choose, you will often be limited to less than 300X even on clear nights. There is no law that says you can’t try to go higher, but typically the image quality will be degraded by the distortion introduced by the atmosphere. So don’t believe the box that says that the cheap 50 mm telescope in the pretty box will let you go to 500X. Ain’t gonna happen! Once you have your telescope assembled the next most important thing to do is align the finder, be it a red dot finder or a finder scope. We want to be sure that the finder and the telescope are looking at the same thing. This is best done during the day as stars and planets are moving all the time. We need a stationary target. Set up your telescope so it is level. Pick out a distant target, at least 100 yards away and preferably ½ a mile, 1 KM, or farther. I like to use telephone poles or power poles as the cross arm provides an X to target. A distant chimney works well too. Anything that will provide a precise distant point to target. Remove the lens caps and put your highest number, lowest power eyepiece, in the diagonal or focuser. Now look along the tube of the telescope, not the finder, and point the optical tube at the target. Now look through your eyepiece and adjust the optical tube until you can see that pole, chimney, whatever target you choose, in the low power eyepiece. Remember you are not using the finder scope at this point. Get the target centered as best you can. If you can lock the telescope in this position, do it now, then recheck to be sure the target is still centered. Next, you will adjust the finder so that it is also pointing at the same target. Typically there are screws on the side, top or bottom that allow you to adjust the position of the finder. You can see the two black adjustment screws on the finder scope show in this photo. An RDF would have similar dials. Make those adjustments until the finder is pointing at the same target as the scope. Now, check the eyepiece to be sure the optical tube has not moved. Check the finder again to see that the finder and the telescope agree. Optionally, you can further fine-tune this by putting a low number, high power eyepiece in the focuser/diagonal. Fine tune the centering of the target in the eyepiece. Now fine tune the finder so that they match exactly. Your optical tube and your finder are now aligned. When you use the telescope at night you may have to make a minor adjustment as finders tend to get bumped. My first step during each observing session is to pick a bright star and use the finder to point the optical tube. Now I check the eyepiece and center the star. Then I go back to the finder to see if it needs a slight adjustment. It only takes a few seconds and it leads to much more accurate pointing all evening. Eyepieces are a very important part of the telescope system. The eyepiece takes the image and magnifies it. The reason you typically have more than one is that some objects look better at low magnification and some look better at high magnification. Two eyepieces are enough to get you started. This will give you high power and a low power choices so you can try each on what you are observing. Over time you will get to know what looks best at high power and what looks best at low power. Over time you will likely want more magnification options to that you can optimize the image. You can add more eyepieces of different focal lengths or you can add a Barlow lens which gives each eyepiece more than one magnification. Let’s see how this works in a real situation. Let’s say you are looking at the Moon. You have a 114 mm aperture optical tube with a 1000 mm focal length. It came with a 25 mm and a 10 mm eyepiece. This is a common starter eyepiece set. The 25 mm will give you 40X or 40 power. (1000/25 = 40) The 10 mm will give you 100X. The Moon looks great at 40X, and 100X allows you to get closer to examine the surface in more detail. But what if you wanted to try to get even closer. You could buy a 6 mm eyepiece which would give you 167X. Now you have three magnification choices. Or you could get a 2X Barlow. If you put the 25 mm eyepiece in the 2X Barlow it would work like a 12.5 mm eyepiece for 80X. With the 10 mm it would work like a 5 mm eyepiece for 200X. With one Barlow you now have 4 magnifications. Another option is a zoom eyepiece which works like the zoom lens on a camera. It covers a range of magnifications and allows you to zoom in and out without having to change eyepieces. The 8-24 mm zoom range is very popular. If we look at using one with our example 1000 mm FL telescope, this one eyepiece will provide 41.6X to 125X and every magnification in between. If we use the zoom with a 2X Barlow than we have 83.3X to 250X. This one eyepiece with one Barlow gives us a very wide range of magnifications to explore. Unfortunately, we can’t just keep increasing the magnification. If you have ever used a two finger zoom to look at a photo on your phone or tablet, you have seen that if you zoom too much the image starts to look bad. The same happens with telescopes. If we apply too much magnification, the image starts to degrade. It may get bigger but we don’t see any more detail. In fact, we might see less detail. Earlier I defined “maximum practical magnification” as 2X the aperture in mm, millimeters. So this 114 mm telescope we are using in the example would have a 228X maximum practical magnification. However not all objects will look good at 228X, so having a selection of magnifications allows us to optimize the image to see the most detail, and that best image is often at less than the maximum practical magnification. The real limiter to how much magnification we can apply is the atmosphere. We are viewing the Moon, the stars and planets through 60 to 100 miles of air which distorts the light coming to the telescope. The more turbulent the air the less magnification we can apply. This is like looking through a glass bowl of boiling water. We call this atmospheric turbulence the “seeing” condition. When the atmosphere is calm we have good seeing. When it is turbulent we have bad seeing. There is nothing you can do about this, however, by having a selection of magnifications available you can pick the best magnification for the object you are viewing under the current seeing conditions. Transparency is another factor that affects what we see. If there is a lot of air pollution, humidity or dust in the atmosphere, it will scatter the light and reduce the magnification that will give us the best view. Sometimes the sky looks clear, but we are actually looking through a thin layer of very high clouds. This sometimes reveals itself by showing a ring around the Moon. There are no hard and fast rules as to what magnification you should use for any given object. However, planets, double stars, and globular clusters are typically higher power targets. They are usually best viewed at greater than 100X. Many nebulae and large open star clusters often look best at less than 100X. You will have to experiment to see what looks best in your telescope, from your location based on the current atmospheric conditions. But now that you understand how eyepieces work you can explore what you have and make plans to expand your eyepiece collection. Refractors work well as daytime spotting scopes. In fact, most spotting scopes are nothing more than refractor telescopes that have been optimized for daytime use. While a 90 degree diagonal is best for astronomy, many prefer an eyepiece angle of 45 degrees for daytime use. This is very popular on commercially available spotting scopes. In the photo, you can see one of my refractors configured for daytime spotting scope use showing the correct image 45-degree diagonal. I have a second 90 degree diagonal that I use for astronomy. I just remove the 45 and slip in the 90 at night. Refractor telescopes produce an image that is right side up, but reversed left and right, so when considering a 45 degree diagonal for daytime use look for one that is a “correct image” diagonal. This corrects the left and right image so that signs look right and boats on the lake are going in the correct direction. Binoculars and spotting scopes include these correcting features. To the right you see the same telescope fitted with a 90-degree “star diagonal”. This makes it much easier to view high targets than if I was using a 45-degree diagonal. Just as with nighttime “seeing”, we are limited by how much magnification we can use during the day because we are looking through air. We get heat shimmers off the ground and we get dust, humidity and air pollution which scatters the light. As a result, the magnifications used during the day are typically less than what we use for astronomy. If you look at commercially available spotting scopes, most top out at around 60X. And most people use daytime magnifications of 50X or less to maintain the quality of the image. You can also use MCTs and SCTs as daytime spotting scopes. Just be aware that these tend to have very long focal lengths and so the low power magnifications may be too high to be practical for daytime use. Check to see the low power capabilities are of your MCT or SCT telescope before you buy a correct image diagonal for daytime use. If the lowest you can go is greater than 40X, you may not find this optical tube practical as a spotting scope. 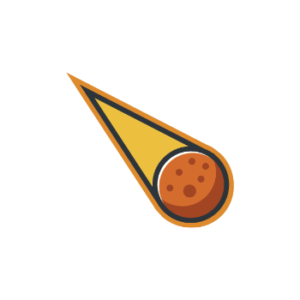 The Moon is usually the best first target. It is large and bright and easy to find. We can view it at low power which shows the moon in the context of the surrounding star field. Or we can use high power to probe into craters and mountains. The best time to view the Moon is when it is less than fully illuminated. This creates shadows which give the lunar surface features greater depth and texture. When the Moon is fully illuminated, the full Moon, everything is brightly light with very few shadows. It almost looks flat. So a monthly plan to view the moon on every clear night is a great idea and a great way to get to know your telescope. As that dark/light line, called the terminator, travels across the surface it can reveal some very interesting things. I usually recommend the Orion Moon 260 map to beginners. It does a wonderful job of showing the Moon and points out 260 key features including the Apollo landing sites. Because the Moon is so bright, many people find it uncomfortable to view with a telescope. I prefer to use a moon filter with my telescopes. These filters typically cost $25 or less. I usually recommend a 25% filter which lets through about 25% of the light. I also feel it improves contrast, showing me details I would otherwise miss. The inner planets are usually the next thing that people want to view. However, these are not always in the sky. The planets move around the Sun at a different pace than the Earth, so they can be nearer to the Earth at times, farther away at other times. Sometimes they are on the other side of the Sun so they will not be in our night sky. When they are in the sky, they will always travel in the southern sky along an arc that is called the ecliptic. This is the same arc that the Sun and Moon travel. Once you know where to look, they are easy to spot when they are in the sky. Jupiter and Saturn are wonderful to view. Even with a 70 mm telescope, you can see cloud bands on Jupiter and the great red spot. You can also see the 4 bright moons of Jupiter. Saturn is the rock star of the planets. The rings are spectacular even in a small telescope. With a larger telescope, you can see some of Saturn’s moons which look lie stars. Of course the more aperture you have the more you can magnify the planet and the more detail you can see. Venus is the third brightest object in the sky, after the Sun and the Moon. However, it is covered in clouds so you can’t see any details of the planet. Venus goes through phases, like our Moon, and these can be observed. Because it is closer to the Sun that the Earth, Venus is usually best observed near sunset or sunrise. I like to use my moon filter when viewing Venus. Mars comes close to the Earth every two years. This is why Mars missions occur on a two-year cycle. When it is close it is possible to see shadings on the surface and the polar ice caps. One of the challenges with Mars is that it is often subject to dust storms and some will envelop the entire planet, obscuring our view of the surface. Mercury is very close to the Sun and can only be seen very close to sunrise or sunset often just before the Sun has fully set. It will appear as a bright star. Under high magnification, you can see that it is actually a disk rather than a star, but you are unlikely to see any other detail. Because Mercury is so close to the Sun, you must be VERY careful. If you were to accidentally get the Sun, even the setting Sun, into view you could damage your eyes. So be very careful if you are going after Mercury. Neptune and Uranus can also be seen but they are very distant and so, much harder to pick out. In a small telescope, say less than 100 mm aperture, these are going to look like stars. Even in a larger telescope under higher magnification, they are small blue or blue-green dots in the sky, but they can be fun to find. Within the solar system, you can also occasionally see comets and asteroids that come close to the Earth. But, these are very elusive because they are small and they are in a different location each night. 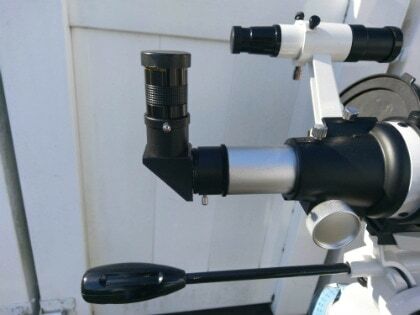 You can view the Sun with any telescope, but you MUST have a solar filter on the scope that covers the entire opening on the front of the scope. Never use a solar filter that attaches to the eyepiece. Pointing your telescope at the sun without the proper filter will damage your eye and can lead to blindness. You don’t need a large scope to view the Sun. Even 40 mm to 60 mm telescopes can be used for the Sun and the bigger scopes work well too. To the surprise of many, it is possible to view the Moon, Jupiter, Venus, Mars and sometimes Saturn during the day. Mercury is too close to the Sun to be safe, so don’t try it. You have to learn how to predict where they will be, but for now, be aware that daytime observing is possible. Just make sure you are well away from the Sun. After the Moon and the planets, we move to the deep sky objects. These are outside our solar system, deeper in our galaxy, the Milky Way. Some are outside our galaxy. 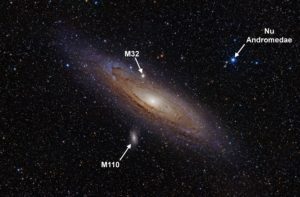 When you look at a chart, or one of the computer/phone apps, you will see that deep sky objects are rated by a scale called magnitude. In simple terms the lower the number the brighter the object. Turn Left at Orion, the book I mentioned earlier, does an excellent job of rating targets as to what size telescope works best for each target. To a large extent, this is related to the magnitude. My suggestion is to start with objects that are magnitude 4 or less. These are the brighter objects and are typically visible to the naked eye, even at moderately light polluted locations. That will make them easier to find. They will also be more satisfying to view than something that is magnitude 8. On any given night you will have plenty to view. Select targets that are higher in the sky, say above 30 degrees altitude. As you view closer to the horizon you have to deal with more light pollution and more atmosphere. This reduces the quality of the image you will see. Typically the higher you go in the sky, the better the image as you are looking through less atmosphere. Also, determine which part of your sky is the darkest. If you have a major city to the west, there is likely a bright light dome in that direction. Your darker location will be away from that light dome and you will have greater success finding and viewing your targets. Focus your observing in the darker part of your sky. After stars, the easiest things to find are the bright open star clusters. Many can be seen naked eye. The Pleiades is a good example of an open cluster. This is an open star cluster that can be found in the constellation of Taurus which is in the sky in the fall. There are well over a hundred such clusters that can be seen and enjoyed even in a small telescope. Some can even be viewed with binoculars. Deep sky objects, DSOs, include open clusters, globular clusters, galaxies, nebulae, and double stars. The larger the aperture of your scope and the darker the sky the better these will look in your telescope. There are thousands of DSOs to enjoy. How to Find Targets You Can’t See With Naked Eye? Here we address two challenges, telescope instructions on how to know what to look for and how to find it. A good source of observing lists is the Astronomical League. They publish lists of all sorts to give you an organized program to follow. And they provide awards for completing the programs. Turn Left at Orion, TLAO, is one of the most popular astronomy books ever published. The key reason I recommend Turn Left at Orion is that it provides excellent diagrams of what things will look like in your telescope. So many books include beautiful Hubble Space Telescope photos, but that is not what you are going to see in your telescope. TLAO shows you what to look for and how to find it. Once you master star hopping you can find anything that is within the optical capability of your telescope. If you are using an AltAz mount, a second method is to use a phone or computer planetarium app that presents a map of the sky and the real-time altitude and azimuth coordinates of your target. If you search in your app store for astronomy apps you will find such titles as Stellarium, SkEye, SkySafari, and others. Some of these will let you point your phone or tablet at the sky and it will tell you the names of the bright lights in the sky, be they stars or planets. This can be very helpful when you are trying to confirm that first bright star that is your starting point for your star hop. I like to use Stellarium on my home computer and my phone. It can be downloaded free for your desktop Windows computer. It is also available for your phone or tablet for a small fee. In the photo, you can see the 360-degree scale I added to my AltAz mount. I purchased this on Amazon. I point the zero to North. Then I can turn to the appropriate azimuth degree required. Before I added this I used a compass but this works better. Using one of the planetarium apps I can get the real-time altitude and azimuth coordinates for my target. I use a carpenter’s digital angle gauge to set the angle of the scope and a compass to estimate the azimuth. For example, let’s say I wanted to find the Owl Cluster, NGC457, which is a beautiful open cluster in the constellation of Cassiopeia. I could use the search feature in the app to find it. As an example, it would tell me that the Owl Cluster is at 42 degrees azimuth (approximately northeast), and 35 degrees altitude, height above the horizon. I would turn my scope to 42 degrees using a compass or a degree wheel on the mount of the scope. Then I would use the angle gauge to find 35 degrees altitude. That will put me on, or very close to the location. I would use my low power eyepiece to look around and, bingo, there it is. 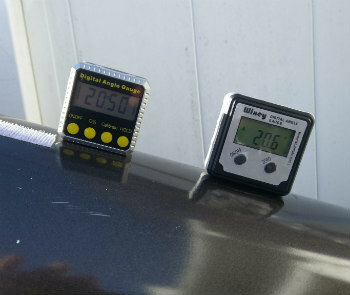 In the photo to the right, you see two examples of digital angle gauges. These are magnetic and are sitting on the 8” Newtonian optical tube of my Orion XT8 Dob. If you are using an equatorial mount, you could use a paper map or one of these apps to find the right ascension and declination coordinates. These are represented by dials on the mount. Once you have the mount polar aligned, per the video I provided in the mounts section, you can turn the scope till the dials match the coordinates. If you are using a GoTo mount, first you align the mount according to the instructions for your mount. Then you input the name of the object you want to see. Most things have a variety of names. For example, the Pleiades open star cluster is also called M45. Or they have a New General Catalogue, NGC, number. The Owl Cluster I mentioned earlier is NGC457. You can get these numbers from paper charts or the apps I mentioned. Once you put this into your GoTo handset the telescope will swing to that target. Once you confirm that it is in the field of view of your low power eyepiece, you confirm it in the handset. The GoTo mount will track it for you. This is almost like having a self-driving car. This not about the telescope but about where it is being used. Your telescope, used at a dark site, will show you a lot more objects and a lot more detail than if it is used at a light polluted site. It is also easier to star hop at a darker site because you can see more stars. If you live in a city or bright suburb, star hopping can be more of a challenge. There is not much you can do about light pollution other than to take this into consideration when you are picking your observing location and what you wish to observe. You may wish to plan observing sessions where you pop the telescope into the car so you can go to a darker location. For example, the Andromeda galaxy, when viewed from a light polluted location, may look like a grayish smudge against that light polluted sky. Hop in the car and drive 30 minutes to a dark location and the Andromeda galaxy will look very different. You may be able to see the dust lanes, a bright core, and the overall shape. Same scope, different location. So, if you are in a city or brightly lit suburb, take ease of car travel with the scope into consideration. This is not vacation travel but a quick trip to a darker location. Although planning a vacation to a dark site can make for a great family experience. If your home location is very bright then you may wish to focus on these targets at home. Also, note that the Moon itself is a huge source of light pollution. Look up during a full moon and consider the number of stars you see. Do the same when it is a new Moon and the sky is dark. You will see a lot more stars when the Moon is not in the sky. Many deep sky objects will be washed out by the bright Moon. Save them for nights when there is no Moon. When you take a trip to a darker location, shift your attention to the targets that are more sensitive to light pollution. This way you spend your time successfully observing what you can see from your location and less time being frustrated over what you can’t see, or how dim or fuzzy they are. How to Care for Your Telescope? If your mount is on a tripod, check the bolts and screws periodically to be sure they are tight. If these loosen up, the mount will wobble and the image in the scope will shake. If you have a Dobsonian tabletop or floor mount, check to see that the bolts and screws that hold the base together are tight. 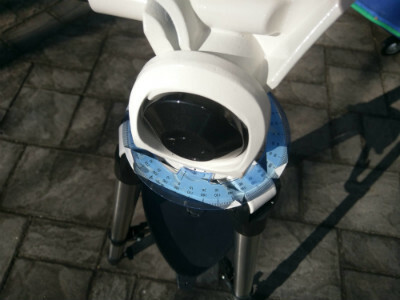 If the mount sticks as you rotate the telescope, consider removing the bottom plate and cleaning it off. Dirt may have accumulated on the plate or on the nylon/Teflon bearings. A refractor typically requires the least care. Keep the lens covers on and store it in a dry area and you should have years of service with little care required. Wiping the dust off the outside is about all you will really need to do. The optics should remain well aligned for the life of the telescope. SCTs and MCTs include mirrors and lenses. While occasional alignment can be beneficial, many people go years between alignments. Like refractors, these are mostly closed systems and typically require very little care. Again keep your dust covers on and store them in a dry location and you should be fine. Newtonian reflectors need the most care. Typically you want to do an alignment of the mirrors from time to time. This is a procedure called collimation. It is not hard to do but, like anything else, it takes a little practice. Once you have done this a few times you can complete the process in a couple of minutes. The trade-off for this higher maintenance is that Newtonian reflectors are the king of price per inch of aperture. If you have been out on a night that is heavy with dew, leave the covers off the scope and your eyepieces when you put the scope away. Put them on the next morning, after everything has had a chance to dry. Resist clearing the primary lens or mirror. If you keep the caps on, dust and dirt accumulation should be minor. A little dust on the mirrors or on the front lens has very little impact. But if you do a poor job of cleaning them you can drag dirt and grit across the surface causing damage to the coatings, and that can have a significant impact. My Newtonian has had its main mirror cleaned once in 10 years. My refractor has been cleaned once in 3 years. Check with your manufacturer as to what they recommend be used to clean the mirror or lens as they know best as to what will not damage the coatings. When you buy a first telescope package you will have enough to get you started. But over time you may want to add things to enhance your observing experience. In addition to Turn Left at Orion, that I mentioned earlier, you will likely want a star chart. 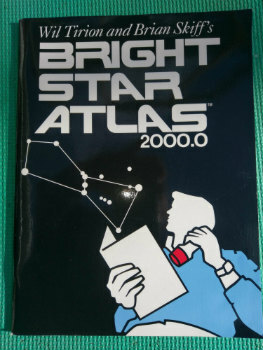 One of the less expensive ones that focuses on the brighter objects in the sky is “Bright Star Atlas 2000”. I think it makes a great first star chart. Great instructions and more than enough to get you started. There are a wide variety of optical accessories cons consider. Generally, you don’t have to stick to the brand of the telescope for upgrades. But don’t run out and spend a lot of money right away. Work with what you have for a while. You will have a better idea of what you want after some time spent with your new telescope. Eyepieces, filters, and diagonals are generally of a standard size so you can mix brands. There is such a wide range of styles and prices that you can easily spend more on these accessories than you spent on the scope. But they can be used across a number of scopes. I use the same eyepieces in all four of my telescopes. There are a large number of astronomy clubs. If you do a search on “astronomy clubs” you will likely find a listing that can help you. Most clubs welcome visitors and are happy to have you attend a few meetings so you can get a feel for the club and the people. Many astronomy clubs have public observing nights. Plan to attend some of these so you can speak to the members. Likely you will find someone who knows your telescope and will be happy to help you. Astronomy and telescopes can be a daunting topic, especially for beginners. But, if you ease into it you will find a great deal of enjoyment with your telescope without having to get too deep into the technical aspects. And, while there are lots of shiny trinkets out there, you don’t need a lot to enjoy the sky. There are thousands of objects you can observe even with a 100 mm or smaller telescope. Start with the easy ones and work your way into the more difficult targets. And don’t forget to take into account your light pollution situation. Wherever your first scope fits into this range, know that it can have a long and productive life. If you started big, adding something smaller for convenience later can be a good idea. If you started small, then adding that big scope can be something for a future date once you know how to operate a telescope. And personally, I start every observing session with binoculars, scanning the sky and taking in the larger view that binoculars offer. Remember that your eyes are your primary astronomy tools. Just look up! I wish you clear skies! Reflector vs. Refractor Telescopes – Which Is Better? 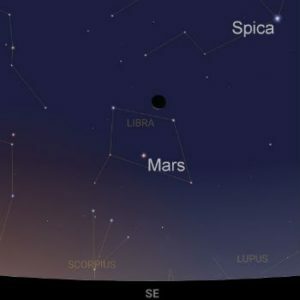 Which Planets Are Visible Tonight? What is a Star Chart and How Do You Use One? Ed is a member of the Astronomical Society of Long Island, ASLI. He is also a member of the Custer Institute and Observatory where he is a featured speaker.